Yes! I’ve finished my nutrition exam and assignments and have the whole summer free to relax and be creative! Finally I have time to make new recipes again! 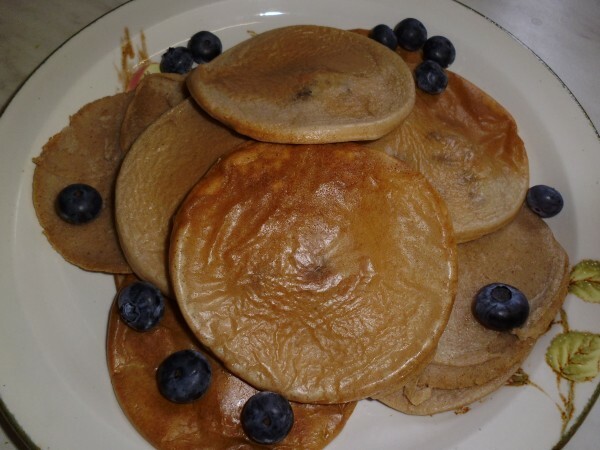 I started off by making these delicious buckwheat and brown rice pancakes. The buckwheat gives them a delicious nutty flavour. They are gluten free and make a tasty breakfast! I used a JML pancake pan to make my pancakes, but any pan would be suitable. Weigh out the buckwheat flour and brown rice flour and pour into a large bowl. Add the other dry ingredients including the flaxseed, cinnamon and sea salt and mix in with a wooden spoon. Now make an indent in the middle of the flour. Put in the wet ingredients including the almond butter, agave nectar and water. Now mix well with the wooden spoon until the mixture forms a smooth batter. Next add in the raisins and mix in. Now heat a large pan over a low heat. Using a dessert spoon, drop 2 spoonfuls of the mixture onto the hot pan. Repeat 3 more times into the large pan until you have 4 medium sized pancakes forming. Cook for about 2 minutes until there are bubbles throughout the surface and you can easily peel away the pancake from the pan. Flip over and cook for another 2 minutes until golden brown. Pile the pancakes on top of each other on a plate. Repeat this process 2 more times until all the batter has been used up. Finally drizzle the pancakes with agave and freshly squeezed lemon juice. Delicious served with spoonfuls of peanut butter and blueberries. Happy Pancake Day everyone! Today I’m going to be making my quinoa and brown rice pancakes which are gluten-free and vegan! The almond milk replaces the dairy milk and the flaxseed binds the mixture instead of the eggs! If you have a Vitamix blender, pour in the quinoa and rice and blend until it has formed a fine flour. Alternatively you can cook the quinoa in filtered water for 15 minutes and brown rice for 40 minutes and then place them in the blender. Add the desiccated coconut, flaxseed, agave nectar, almond milk and water to the blender. Mix until it has formed a liquid batter. Heat a small pan over a low heat. Pour in enough batter to form a medium sized pancake. Add a fruit topping of your choice such as sliced banana, strawberries or raspberries. Drizzle with agave nectar and lemon juice. Delicious served with spoonfuls of nut butter. These delicious veggie cakes are a treat to have for a main meal! 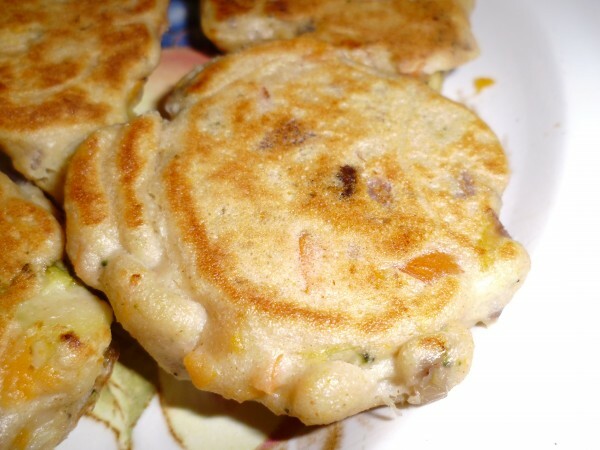 They are a combination of savoury pancakes, scones and veggie burgers! They are also a great way of using up any leftover vegetables you have in the fridge! Preheat the oven to 200C. Bake the sweet potato for 45 minutes. Now prepare the batter. Add the quinoa, brown rice, desiccated coconut, flaxseed and almond milk to the Vitamix blender. Blend on full power for 30 seconds. Next, melt the coconut oil in a hot pan. Add the chopped onion and sliced mushrooms. Fry for a few minutes. Add the finely chopped carrot. Lastly add the chopped garlic, cooked sweet potato cut into cubes and the handful of spinach. Now add the cooked vegetables into the batter in the blender. Mix with a spoon. I use a specialised pancake pan with 4 moulds to cook 4 veggie cakes, but you can add spoonfuls of the mixture to a hot pan to cook. Add 2 dessert spoonfuls of the batter mix to the hot pan, cooking 4 veggie cakes at a time. Cook for 5 minutes on one side then flip over and cook for another 5 minutes or until golden brown on each side. 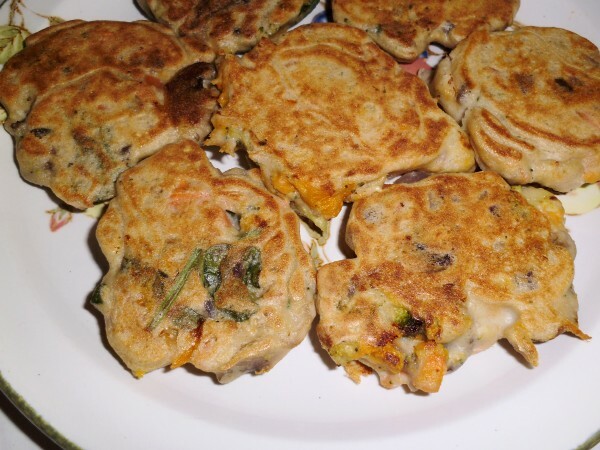 Place the cooked veggie cakes on a plate then cook 4 more. Store in the fridge and eat within 3-4 days. These quinoa & brown rice pancakes make a delicious breakfast on a lazy Sunday morning. They are gluten free and easy to digest. If you have a Vitamix blender, pour in the quinoa and brown rice and blend until it has formed a fine flour. Alternatively you can cook the quinoa in filtered water for 15 minutes and the brown rice for 40 minutes and then place them in the blender. Add the almond milk, desiccated coconut, flaxseed, agave nectar and salt to the blender. Mix until it has formed a liquid batter. Add a fruit topping of your choice such as sliced banana, strawberries or raspberries. Drizzle with agave nectar.